Neil deGrasse Tyson says Trump's "Space Force" is "not a crazy idea"
Will Space Force accelerate space technology? "We are all stardust," astrophysicist Neil deGrasse Tyson tells CBS News Chief White House Correspondent Major Garrett on this week's episode of "The Takeout." "And you have a connectivity to the universe that for me is uplifting rather than ego-busting." Tyson joined the podcast to discuss his new book, "Accessory to War: The Unspoken Alliance Between Astrophysicists and the Military." The book, written with co-author Avis Lang, explores the long and complicated history of how the study of astrophysics changed warfare. In July, "The Takeout" welcomed NASA Administrator Jim Bridenstine, who described how reliant we are on space technology. "Our very way of life is dependent on space," Bridenstine said at the time. "The way we navigate. The way we communicate. Over-the-horizon communications. The way we produce food. The way we produce energy. The way we do disaster relief. In fact, the way we do banking in the United States of America, if we lose the GPS signal, there are no interbank transfers. That means there will be no milk in the grocery store. Our way of life shuts down." Asked about the accuracy of Bridenstine's description, Tyson called it an "understatement," saying "almost everything we care about in modern civilization that we think of as modern civilization is today enabled, magnified, or distributed or contributed to by space assets." Tyson stressed that protecting a nation's assets, including those in space, is a "fundamental part of what it is to be a sovereign country." And according to Tyson, President Trump's proposed Space Force may an important step in that direction, although its mandate should be expanded to include the problems like space debris and protecting citizens from rogue asteroids. "So it's not a crazy idea," Tyson said. "A lot of Trump haters want to hate everything that comes out of Trump's mouth. I'm an academic; I analyze everything. And just because it came out of Trump's mouth doesn't automatically mean it's a crazy idea." On a lighter note, Garrett asked Tyson to settle a long debate: should Pluto be considered a planet? "Don't get me started," said Tyson, recalling the amount of angry mail he received from elementary school students when Pluto was downgraded to a "dwarf planet" in 2006, forever changing astronomy textbooks. "You're taking Pluto away from me!" joked Garrett. "Pluto is one-fifth the mass of our Moon," Tyson replied. "It crosses the orbit of Neptune. This is just bad behavior for a planet." 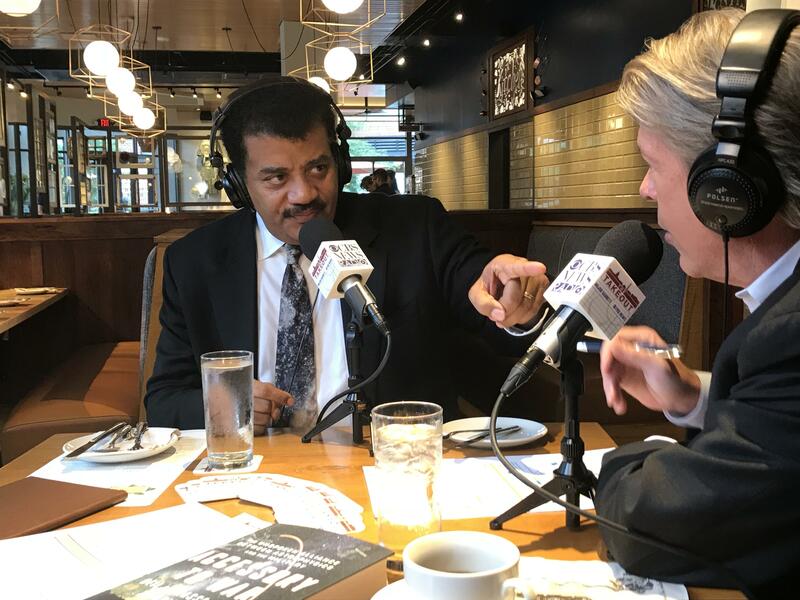 For more of Major's conversation with Neil deGrasse Tyson, download "The Takeout" podcast on Apple Podcasts, Google Play, Stitcher, or Spotify. New episodes are available every Friday morning. Also, you can watch "The Takeout" on CBSN Friday at 5pm, 9pm, and 12am ET and Saturday at 1pm, 9pm, and 12am ET. For a full archive of "The Takeout" episodes, visit www.takeoutpodcast.com. And you can listen to "The Takeout" on select CBS News Radio affiliates (check your local listings).